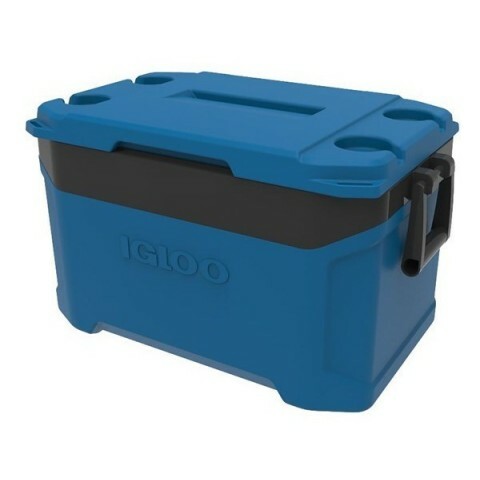 The Lattitude 50 Blue Cool box is the perfect addition to your camping or caravanning trip. The cool riser technology improves the cooling performance, keeping all of your food and drinks fresh. The lid also contains four cup holders, allowing you to store all your drinks easily during your outdoor dining experience. The addition of a mobile device stand within the lid also allows you to store your phone and tablets. Designed for convenience, the cool box has swing-up side handles to allow for comfortable carrying, and handy tie down points on the lid and handle for secure fastening to your vehicle to allow for easy transportation to your outdoor destination. The Latitude 50 cool box is the perfect addition to your camping or caravanning trip. The cool riser technology improves the cooling performance, keeping all of your food and drinks fresh. The lid also contains four cup holders, allowing you to store all your drinks easily during your outdoor dining experience. The addition of a mobile device stand within the lid also allows you to store your phone and tablets. Designed for convenience, the cool box has swing-up side handles to allow for comfortable carrying, and handy tie down points on the lid and handle for secure fastening to your vehicle to allow for easy transportation to your outdoor destination. Igloo are world leaders in providing quality, durable, and innovative cooling products to improve your experiences dining in the great outdoors.